Every year around this time of the year we would watch for it. We would hear a delivery truck coming down the street and race to the window, our little faces pressed against the glass hoping, willing it to stop at our house. And then would come the day that the truck did finally pull up to the curb in front of our house. We held our breath as the delivery man rummaged through the back before emerging holding something…was it the right size? Was it the right shape? The doorbell would ring, we would hear the ‘thunk’ of it being dropped on our doorstep and we would race to open the door and drag it inside. I didn’t think much of it at the time, but our mom always looked kind of wistful as we cut through the tape and lifted the lid of the box. Once opened, the contents of the box revealed themselves. Packages wrapped in colorful paper, some with the coveted tags which read, “Open Now” and some we knew would have to wait until Christmas morning. But, what we were most excited about were the packages wrapped in foil or tucked into Christmas tins. Because we knew that those held the true treasures. Sugar cookies perfectly decorated, peanut butter balls, indoor S’mores, Rice Krispie Treats and candy. These treats, this box, was a lifeline to our grandmother. And for two little girls living in California with no grandparents nearby, it represented so much. We imagined her at her home in Michigan baking in her kitchen and then carefully wrapping up the goodies to send all the way across the country to us. Grandma passed away two years ago this Christmas. She was a farmers wife who worked tirelessly from sun-up to sun-down. She loved gardening, baking, her family and most of all The Lord. I loved every single treat that came from that box she sent to us. But the one that makes me feel the most connected to her, and to my mom are her Molasses Cookies. Two weeks ago, as my parents were traveling from Heather’s home in Georgia to my home in Oregon, they got caught in a horrible storm and wound up stuck on an Interstate in Texas unable to drive due to the 4 inches of ice and countless accidents ahead of them. They were there for 25 hours. And we all felt so helpless. I could talk to them on the phone and Heather and I were calling the local authorities to try and get them help and praying and praying and praying for them. But I couldn’t DO anything! So, I baked. I baked the one thing that felt the most familiar, the most comforting. When my daughter heard me gathering ingredients in the kitchen she quickly ran in and asked to help. I pulled up a kitchen stool and she sat down and we began going through the steps of the recipe. And as we did I told her all about two little girls at Christmas-time. Little girls, just like her, who anxiously awaited the arrival of THE BOX . I told her about her great-grandmother and how much she loved Christmas. How she would sometimes even not be able to wait until the big day and would sneak a peek at her presents under the tree. I told her about her Nonna, my mom, and how much she loves Christmas and all the traditions she created which we still carry on today. As I talked about my mom I ached just thinking about them being stuck so far away. And I ached because I missed my family…my parents, my sister and brother-in-law and niece and nephew. That wistful look my mom would get every year when the box arrived was because she ached inside missing her own mom. Missing her home in Michigan and all of her family. In reality, the box meant far more to her then it did to us. Cream together shortening and sugar. Add egg and mix thoroughly. Add molasses and applesauce and mix thoroughly. In a separate bowl gently mix dry ingredients together then slowly add to wet mixture. Fold in raisins. Drop dough by the tablespoon on baking sheet and bake for 9-11 minutes. Remove from oven and let completely cool before applying icing. 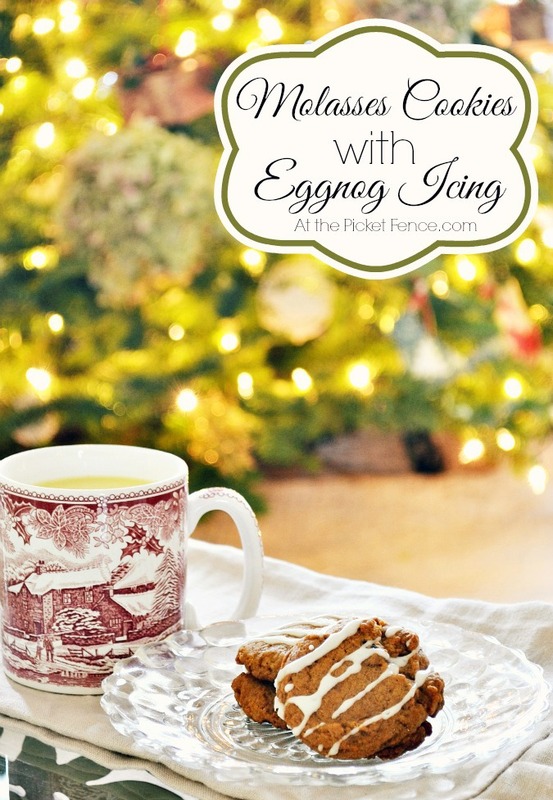 To make the eggnog icing simply add 4 parts powdered sugar to 1 part eggnog. In this case, 1 tablespoon of eggnog to 4 cups powdered sugar. Adjust amounts until you get the proper icing consistency. *Tip: Apply cooking spray to inside of measuring cup prior to adding molasses. This will make it slide out easily when adding to ingredients. I went to bed that night with the sweet aroma of the molasses cookies lingering in the house. It was a restless night of worrying about my parents still stranded in a cold truck on the interstate. As soon as I got up the next morning I called Heather (she’s in a time zone three hours ahead) and got the latest update. We did the only thing we knew to do. We asked for prayer on the At the Picket Fence Facebook page. And then something amazing happened. Something truly incredible! Not only were people praying but they were spurred into action. One dear reader named Connie contacted her daughter who contacted her friend Shiloh who happened to live in the area where my parents were stuck. Shiloh and her boyfriend got access to a truck and somehow, someway were able to find our parents amid all of those vehicles on the interstate. They brought gas for the truck, food and blankets. 47 Comments on "The Box"
You best post ever. You had me geared even before you talked about your parents being stranded. Beautiful and I am so thankful your parents are okay. I am going to bake cookies right now. Really. Love this post! So happy that your parents are okay. I was so worried about them! What a sweet story Vanessa…those cookies sound yummy! 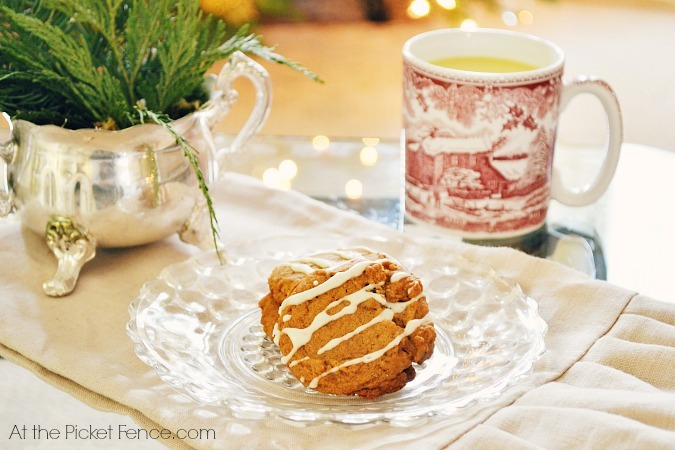 I make a similar molasses cookie they are my kids favorite…thanks for the tip on spraying the spoon can’t wait to try it! LOL Amanda!! Well that ‘Hook’ guy can be pretty scary! 😉 Thanks so much for coming by! I think that is my new favorite Christmas story. God Bless you all. What a sweet post. It brought a tear to my eye. Thanks so much for sharing. God bless you and yours and have a Blessed Christmas. Love it Vanessa! 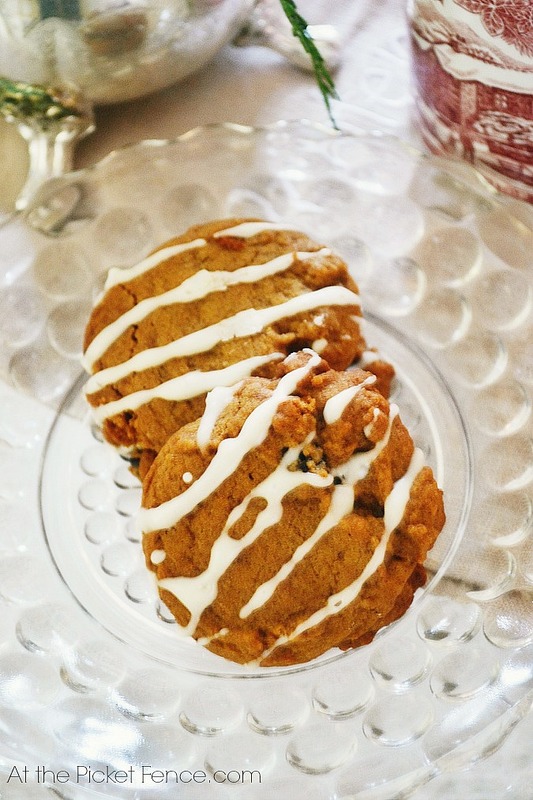 What a sweet story and a delicious cookie recipe! Note to self: Do not read Vanessa’s posts until AFTER work since they might make you cry! I remember anxiously awaiting a similar box every Christmas from my grandmother in California. Sometimes she would mix things up a bit, but there were always Mexican Wedding Cookies in the box, and to this day they are one of my favorites. She’s been gone for over 20 years now and the boxes stopped coming some time before that. I haven’t thought about those Christmas cookies in a really long time. Thanks for the trip down memory lane! Knock out post that tugs at the heartstrings because we can all relate to the bonds of family. Great job, my friend! How wonderful that these sweet angels went out and cared for your parents. The internet can be a scary environment at times but, in this case it showed us just how small a world apart can be if you have good in your heart. I also loved the time you shared with your daughter making the cookies and telling stories of your family history. I bet some evening in the far off future your little girl will be telling stories of a night when she baked cookies with her mom. Oh my goodness! This post should come with a warring!! I don’t like to start crying early in the morning!! Such a touching memory. What a wonderful, faith-filled story! So glad they made it home fine- and it makes me want to try those cookies! So thankful your parents arrived safe to their new home. This story has the makings of a Hallmark Movie! Thank you Julia! And Merry Christmas to you too! Love the red Christmas coffee cup. Where can one get one? Oh Steve…I have tears in my eyes after reading your comment…thank you for blessing me with your words of love, support and encouragement. And your son is pretty easy to love by the way! 🙂 Love you! You just re-opened my eyes to what Christmas is really about. I’ve been stressing about wrapping presents and what’s still left to buy and work…thinking I’m the only one feeling like this and then I read this. I have tears in my eyes and a light bulb that just went off over my head. Thank you! And I’m so thankful your parents are all right. It really is a magical time of year. Thank you Laura! Merry Christmas! I found your recipe over at Thistlewood Farms today. It sounds scrumptious! Yum! Thanks for sharing. Kari sent me over. Oh my! What a beautiful story that has left me misty-eyed. Thank you for sharing it. Thank you for sharing this story, it brought tears to my eyes and made made my heart ache at the love you and your family have for each other. I was not so blessed to have had this type of love growing up. But now do have a loving relationship with my own children and grandchildren. How wonderful the “strangers” who went out of their way to help your parents, surely there is still goodness in this world! Thank you so much for your kind words Rosalina! So glad that you now enjoy a wonderful relationship with your own family…it’s a blessing indeed and one I don’t take for granted. Thanks for coming by and visiting me here! I am crying now….crying for a daughter filled with worry for the parents she loves, crying that my own parents are no longer with me—let alone the Grandma who made me cookies, crying that in this world where so many awful things happen there are still people who would load up supplies to take to strangers on the highway to help them on their journey. What a wonderful Christmas story. Thanks for sharing! Barbara our mother was raised on a farm in Michigan too!! Isn’t it amazing the ways that we are all connected to each other and the memories that are stirred when hearing the memories of others? 🙂 Thank you so much for your sweet comment! I love this story – just beautiful. I don’t know if I wish I’d written all the good stories, but I surely wish I’d written this one. It’s a wonderful, wonderful story of childhood, family, fear, friends and believers, and answered prayer. And it’s wrapped in a beautiful package. Thank you so much!